These thumbprint cookies are a tradition of Mother Lovett’s. I have to admit when I pulled my first batch of thumbprint cookies out of the oven, I smelled her. And no, I’m not talking about her constant release of gas with every step she took. But have you ever seen someone walk and pass gas at the same time for minutes? I smelled the memories of baking with her around Christmastime. It made me incredibly nostalgic, reminiscent, and hungry. So I ate a few cookies in her remembrance. This will be our first Christmas without her. I made the dough a day ahead of time and let it sit in the fridge. She probably would have made it 4 to 5 days in advance, but she also used cheese on her sandwiches that was 3 months old. These thumbprint cookies were so much fun to make when I was younger because they included food coloring. Do you remember how exciting food coloring (in the droppers) was as a child? I think it was so much fun for me because my mother and grandmother threatened my life if I ever played with it. So naturally, I played with it all the time. In this case we color the coconut. It comes out pink and green. For the life of me, I could never understand why the coconut didn’t come out red since we were using red food coloring. Mother Lovett was happy, as she loved the pink. I’ll admit – it is pretty. I’d begin by adding a drop to a cup of coconut and shaking it up. This is about the time where she’d tell me I probably added to much. Once mixed, she’d tell me that I didn’t add enough. So I’d add more. Now that was always too much for Mother Lovett. For the rest of the evening she’d complain about the color of the coconut. There was no pleasing her. Coloring the coconut this year was stress-free. There was no one yelling at me. And I kind of missed it. But it did come out pretty. Once the dough has somewhat softened, you roll it into a ball, dip it in some beaten egg whites, and roll it in the coconut. Mother Lovett quadrupled the batch of thumbprint cookies every year. We never knew how many we’d come out with, since I never rolled the balls into the ‘correct’ size. So each cookie tray always had to have a mix of colors. Her lack of presence didn’t stop me from doing the same. After the cookies bake for 5 minutes, you yank them out of the oven and push your thumb into the middle – hence thumbprint. Again, this is something that I ‘usually didn’t do the right way.‘ After I’d push my thumb into each cookie, she’d inevitably come over and push her thumb into the cookie, overtop of my print. The past few years I had solved this problem. She was too deaf to hear the timer, so I’d sneak behind her, yank the cookies out, push my thumb in and throw them back into the oven. Good thing I was there. Or else we would all be eating black lumps of crusty burnt dough. And she was so blind that she wouldn’t know the difference. Once the cookies were finished, the tacky decorating didn’t stop. We’d make an icing, and also color the icing pink and green. I was always under strict instruction on how to ice the cookies. Funny, I still played by her rules. I still iced them the way she wanted. And I probably always will. These thumbprint cookies are so perfect for the holiday season. 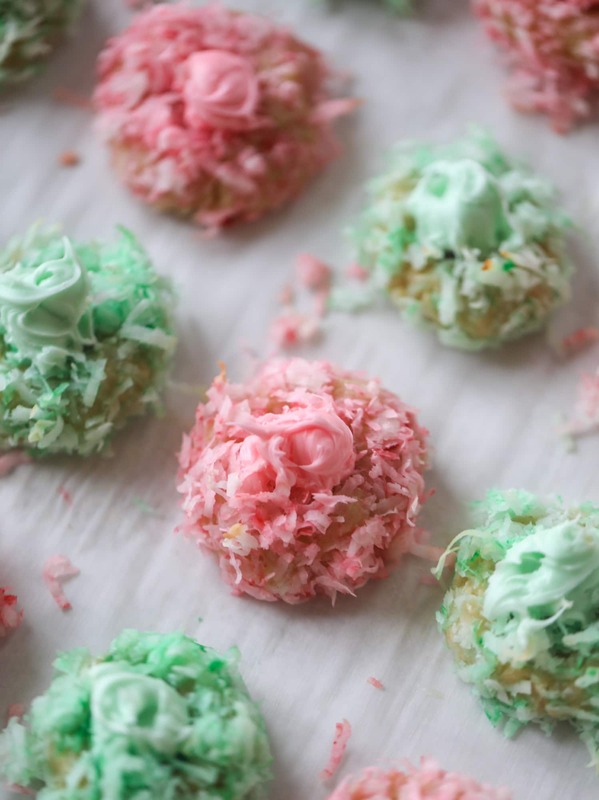 The best butter thumbprint rolled in pink and green coconut and filled with buttercream. So festive! 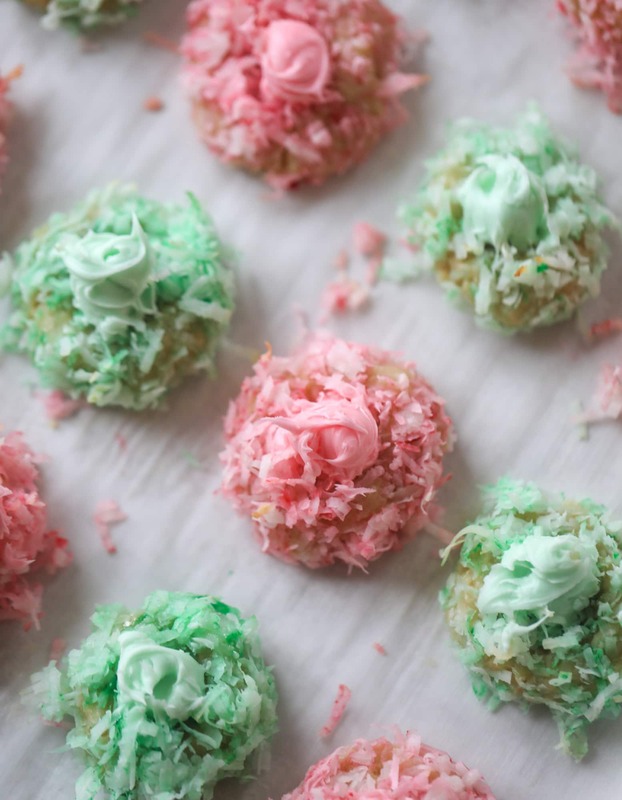 I personally think they look like Grinch cookies – kids love them! Beat the shortening and butter (I use all butter!) with your electric mixer until creamy. Add the brown sugar, egg yolk and vanilla and beat until fluffy. Sift the flour and salt together and beat it into dough until combined. Roll the dough into 1 inch balls. Lightly beat the egg white with a fork. Place 1 cup of coconut in a sealed container with 1 or 2 drops of red food coloring – then do the same with the green. Shake until the coconut is colorful. Place the coconut in separate bowls. Dip each dough ball in the egg white. Roll into the pink and green coconut. Place the balls on a cookie sheet about 1 inch apart. These don’t spread much! Bake the cookies for 5 minutes. Remove them from the oven and gently push your thumb on top of each cookie. Bake for 8 to 10 minutes longer. let the cookies cool completely. You can use your favorite buttercream or cream cheese frosting recipe to put in the center. Honestly, a lot of times I just get canned frosting! I add a drop of pink and green food coloring to frosting in separate bowls and stir until it’s a gorgeous shade. Add a drop of frosting in the center and you’re good to go! I hope you try these cookies in Mother Lovett’s honor. Each time you eat one, I hope you think of her. Her fridge with 95% expired goods. Awww, I loved this post! Just reading it filled me with holiday spirit, and made me so excited to be going to see my own family soon! I love the story woven throughout the post … beautiful memory. Love this post! So sweet…and those cookies are just the most Christmas-y cookies ever! They look so yum! Mother Lovett sounds like a total trip. Love this post. My grandmother always told me I was doing everything wrong too. You are too funny. I am imagining an image of your grandmother walking the streets, leaving a trail of stink. I think that’s going to be me when I grow up, seriously. My mom is getting to that stage already, and she’s only 55, yikes. These cookies are very familiar to me, as we have them every year (or at least we have ones similar). When I was a child I HATED coconut, so I naturally refused to eat them. Now I love coconut, so bring it on! I LOVe thumbprint cookies! I’ve never made them w/the food color though. That adds a nice holiday twist to them! Love the Christmas colored cookies!!! RIP Mother Lovett! Those look so festive!!! I love that! OMG The cookies look amazing!!!!!!!!! My grandma used to make thumbprint cookies too. Which ranged from a sugar cookie w/ a Hershey’s Kiss on it to something kinda like this. GRandma’s termed many things “thumbprint cookies” LOL Your icing too looks amazing. I could eat frosting by the carton and so yeah, that works! Saw your comment on Deb’s site right above mine about Dessert Protein Powder. I have seen it in mags and it’s probably whey which isnt really so hot for my tummy (and not vegan) but it sounds great and interesting. If you’re bored, tell me your thoughts! And as for your question yesterday about craving veggies. Ok so I am not sure how to help someone per se but I have read things to the effect that if someone ONLY craves sweets (which this isnt really the same as not craving veggies) but their could be a candida (yeast) imbalance. Systemic yeast, not vag yeast. If you google candida symptoms possibly you have a yeast issue? That could explain a sweets craving but lack of veggie craving..no idea. You may just be a person who doesnt like them :) However, you’re such a good cook and I bet if you prepared them differently you could impress yourself and love them :) I always undercook rather than overcook as overcooked veggies are ransid…and raw isn’t necessarily the way I’d recommend for newbies either b/c raw can equal pungent and too fibrous. ahhhhhhhhhhh coconut!! my dad would LOVE these!! haha love the comment about the gas! totally normal! You certainly are making your grandma proud, Im sure, by testing all her amazing recipes. These cookies look so festive! You and your family are going to have a fabulous spread this year.. I can only imagine!!! Those look SO good. I’ve never even heard of anything like that version of thumbprint cookies. I adore your posts about your grandma, and these cookies look nothing short of delicious :) Have a wonderful night girl! I’ll definitely think of Mother Lovett…but I need one of those gorgeous cookies first! Aww I LOVED this post! This is what the holidays are all about, celebrating traditions, remembering fun and happy times we have had with those we love. You really are a beautiful writer, thank you for sharing your memories with us! Aw wow these look so yummy and festive!! Love them! I swear, I both crack up and tear up over your posts with Mother Lovett. SO sweet and hilarious. She sounds like a riot. And anyone who makes cookies like THAT deserves a post all their own. These cookies are so pretty! I LOVE coconut, so I bet I would really love these. I’m loving your holiday baking posts :-) Keep it up! I love thumbprint cookies! And I was the same way about food coloring. It fascinated me! Hi! i made these cookies last night! They are so good! Thank you!!! I also made the oreo balls with the regular oreos and in the golden! YUMMO!!! Yum! My mom makes thumbprints every christmas the only difference is she rolls hers in cane sugar or crushed walnuts and fills them with jam. I’m having so much fun reading all the old posts on your blog! While my Grandmother taught me to make a completely different cookie (with a very similar set of corrections) the love for those ladies that taught us to cook, and to LOVE IT (almost as much as we love them) is exactly the same. Thanks for your post, it warmed my heart! I got inspired by your 2018 cookie box post, and am plotting my first forage into holiday cookie box making. Any ideas or recipe for what kind of icing should I use for the middle?. NOMNOMNOM. Can this recipe be doubled? What is the best way to store them? yes! i actually quadruple this recipe and it’s amazing. store them sealed in a container for a week or so, otherwise, freeze them! they are great. Can I make the dough ahead of time and keep in the fridge until I bake them?